Bitcoin and Ethereum are always the talk of the cryptocurrency town. But there is one more player in the top 10 cryptocurrencies which often gets some of that limelight – DASH. If you need a refresher on this crypto, check out this post: DASH Cryptocurrency: Everything A Beginners Need To Know. DASH prices rallied from $200 to $370 in just a span of 2 weeks, achieving a staggering growth of +85%. The best part that I like about Dash price increase is it doesn’t fluctuate much like Bitcoin and it’s been able to hold the rise rather than usual dip that happens with other cryptos. Dash is a good investment because of the practical usage, strong foundation and their management team is doing remarkable work. If you are not holding enough Dash, well you should conider to do so. Our CEO “Harsh Agrawal” met Dash Director of finance Ryan in Bitcoin Miami event. You can watch their discussion here. If you managed to catch this train, or if you’re planning to get on the next one, you’ll need somewhere to store all of your DASH. Jaxx is a popular multi-cryptocurrency blockchain interface wallet created by the Canadian-based company, Decentral. It is an HD wallet which supports 14 other cryptocurrencies and allows its users to restore their funds with a 12-word backup seed key. With Jaxx, you control your private keys and can export/import keys whenever required. The active development community behind Jaxx has given it an easy to use interface. Jaxx doesn’t allow you to perform InstantSend/PrivateSend DASH transactions. Jaxx is available on desktop (Windows, Mac OS, Linux), browser extension (Chrome, Firefox), and mobile/tablet (iOS, Android) versions. They are also in the process of launching a hardware wallet in the coming months. Exodus is a desktop-only HD wallet crafted by JP Richardson and Daniel Castagnoli in mid-2015. It is the world’s first multi-cryptocurrency desktop wallet, and it is completely free to use. 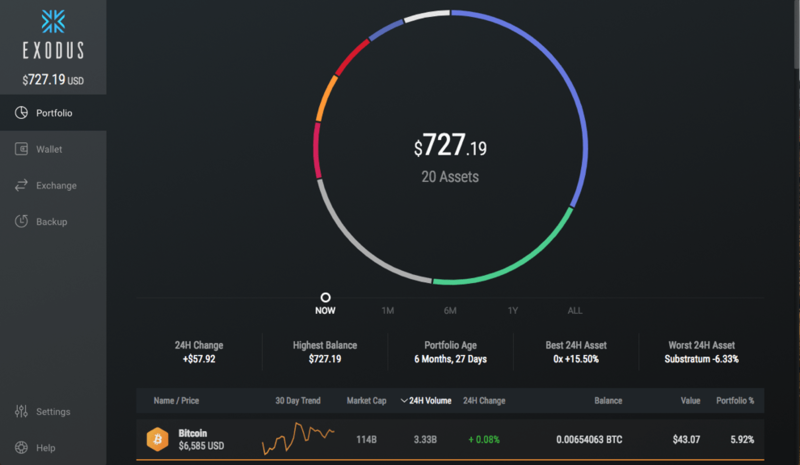 It has an attractive UI, and as soon as you open the Exodus wallet, a pie chart will show you your entire portfolio of coins. Most importantly, I like that Exodus’s ease of use isn’t compromised by a lack of security. It provides its users with a one-click recovery system to restore a wallet with a 12-word recovery phrase. Another interesting thing is that no registration or identity verification is needed to start using Exodus. But you certainly need to take a backup of your seed key. It supports 11 cryptocurrencies, and it is also the first desktop wallet to have ShapeShift built in for exchanging cryptocurrencies. Exodus doesn’t allow you to perform InstantSend/PrivateSend DASH transactions. Exodus is available on Mac, Linux, and Windows. Coinomi is a popular multi-coin, mobile-only wallet. It is one of the largest serving multi-coin wallets, as it supports more than 70 crypto-coins and more than 200 tokens. They recently went to closed-source from open-source because a fraudulent copy of their wallet code had been reproduced. Like every other secure wallet, they allow you to control your private keys with seed keys. The development team is always innovating, and I feel that they have struck a great balance between UI and security. I have been using Coinomi for the past several weeks and haven’t faced any problems. Coinomi doesn’t allow you to perform InstantSend/PrivateSend DASH transactions. It is only available for Android as of now, but iOS support is coming soon. 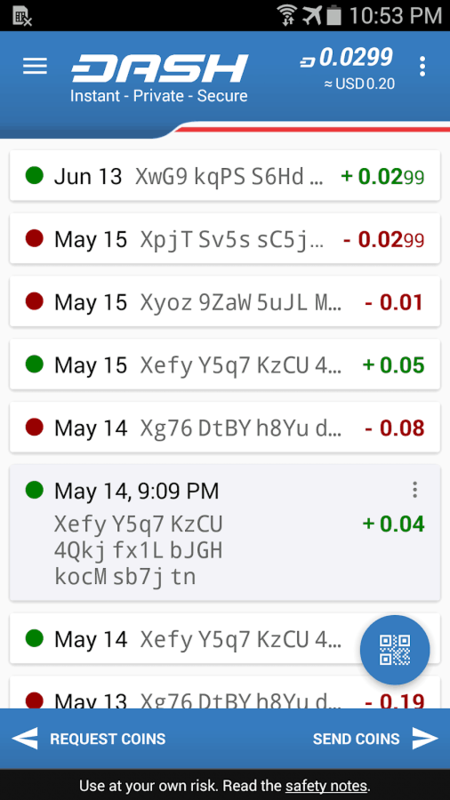 DASH Wallet is the first open-source Android mobile app for DASH, and also the most secure. It was developed by Hash Engineering Solutions with the sole purpose of storing, sending, and receiving DASH securely. 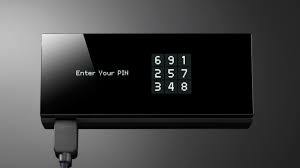 It also allows you to control your DASH private keys and do offline transactions using Bluetooth. It is an HD wallet but it is BIP32, not BIP44 which is used by Jaxx. It does allow you to control your private keys but you can’t export them out of Dash wallet as you do in Jaxx. DASH Wallet allows you to use the InstantSend feature of DASH, but it doesn’t allow you to use the PrivateSend feature. 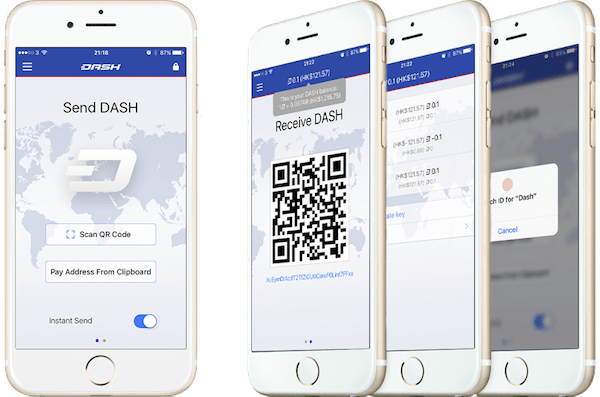 This is the only official DASH mobile wallet available for iPhone. It was launched on the Apple Store after a rigorous review process. It connects directly to the DASH network, which means there are no servers to be hacked and you can always recover your funds in case you mobile is lost or damaged. The ShapeShift integration is a great thing to have here as you can easily convert your DASH into Bitcoin if you need to send a transaction to a merchant that only accepts BTC. DASH Core iOS allows you to use the InstantSend feature of DASH, but it doesn’t allow you to use the PrivateSend feature. At present, it is only available for iOS. 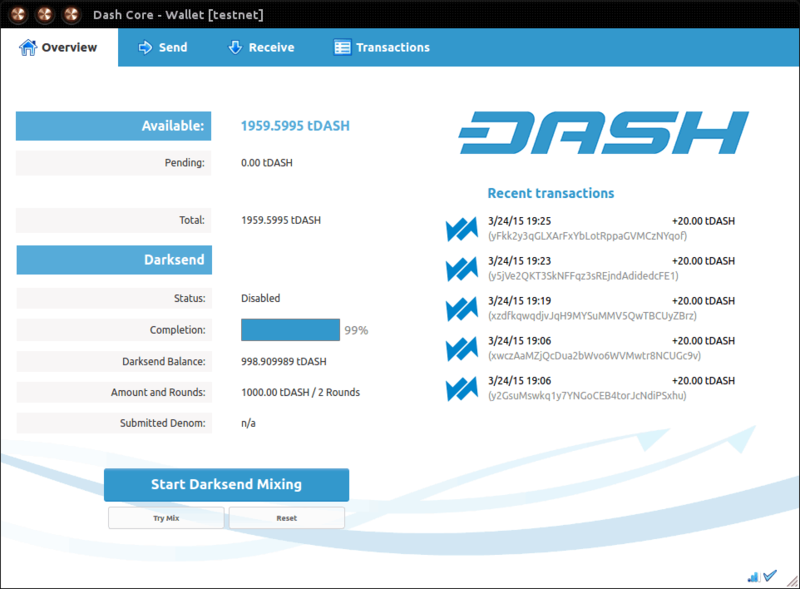 This is the official GUI desktop wallet developed by DASH developers. This wallet allows you to have access to all the features of DASH cryptocurrency such as PrivateSend, InstantSend, governance, masternode management, etc. It also allows you to have full access to your DASH funds, secured with private keys and requiring no ID or verification. If you want to use DASH the way it was meant to be used, this is the wallet for you. But it does require a lot of space on your machine, and it can take a long time to sync with the entire blockchain. DASH Core allows you to perform InstantSend/PrivateSend DASH transactions. At present, it is available for Windows (32/64), Mac, and Linux (32, 64, Raspberry Pi 2). 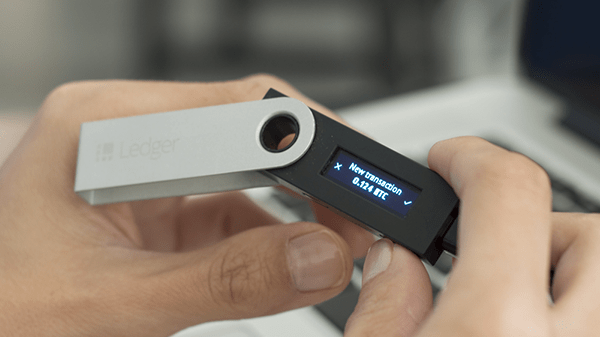 The Ledger Nano S is one of the most inexpensive DASH hardware wallets available ($65). Here, your DASH tokens are stored offline. Whenever you want to spend DASH, the Ledger signs the transaction using the private key stored on the device. Harsh has recorded a few detailed video guides on how to use the Ledger Nano S.
I recommend you watch them on (and subscribe to!) our YouTube channel. One great thing about the Ledger Nano S is that it comes with a small OLED screen which allows you to control your transactions. In terms of security, the security is so robust that you can use your Nano S device even on a hacked computer. If you have a lot of DASH, this is the most secure way to store them all. The Ledger doesn’t allow you to perform InstantSend/PrivateSend DASH transactions (but support is coming soon). Hence, the Trezor wallet was born in a Czech Republic-based company known as SatoshiLabs, making it the world’s first hardware wallet. It has a small OLED screen which shows a randomly generated nine digit pin code and a 24-word recovery seed to keep your funds safe in an offline environment. You can check the official usage instructions for using DASH with Trezor here. Harsh has made a few video guides that you should check out. They will help you learn everything you need to know about Trezor. It is a very light and portable device, similar to the Ledger Nano S, available now in 3 colors – white, gray, and black. Trezor doesn’t allow you to perform InstantSend/PrivateSend DASH transactions (but support is coming soon). KeepKey is another hardware device available in the market for storing DASH. It doesn’t offer much in comparison to the Ledger Nano S or Trezor, and it is more than twice as large. It has the same backup seed key feature with pin code enabled, and it works like the other wallets. At present, it only supports six cryptocurrencies (including DASH). It also comes with a $99 price tag. Consider reading these comments and reviews about KeepKey on Reddit and Amazon. KeepKey doesn’t allow you to perform InstantSend/PrivateSend DASH transactions (but support is coming soon). A DASH paper wallet contains both the private key as well as the public key of your DASH tokens. This means that if anyone gets ahold of your DASH paper wallet, they will have access to all of your DASH funds. That said, it is also the cheapest form of cold storage. 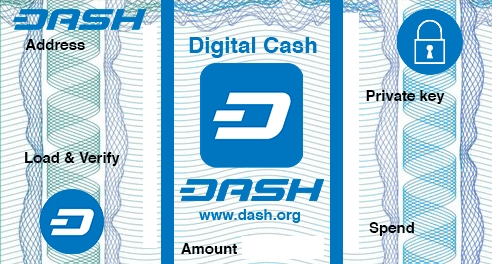 Refer to this official guide on how to make a DASH paper wallet. You can also refer to our guide: How To Make A Bitcoin Paper Wallet. Even though we are using the example of Bitcoin, the process is exactly the same for every other type of cryptocurrency (including DASH). A paper wallet doesn’t allow you to perform InstantSend/PrivateSend DASH transactions. It’s important to store DASH away from an exchange. If you do this, you risk losing all of your coins in an instant. Luckily, as DASH has matured, you have many DASH wallet options available to you. If you are holding a large amount of Dash for the long term, then you should use a hardware wallet like Ledger or Trezor. If you are holding a small amount for a shorter span, you can use official Dash iOS wallet or Coinomi wallet. 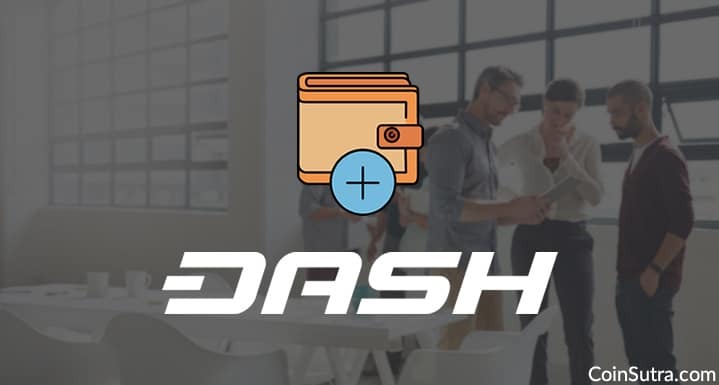 I hope this detailed article on the different types of DASH wallets – including software, hardware, and desktop wallets – will help you in making the right choice for yourself. Do let me know which DASH wallet you are using in the comments section below. And if you find this post useful, do share it with your friends on Facebook and Twitter! hey sudhir nice post. always great to read your post. Dear Sir,can you plz share your whatsapp ,need your suggestion on crypto topic plz.you may directly email your whatsapp if you dont find comfortable here..